Highly energised and auspicious sidh mala (rosary) for professional and business comunity. This Rosary is an arrey of one beads of eight mukhi, nine mukhi, ten mukhi, eleven mukhi , twelve mukhi and thirteen mukhi Rudraksha beads. 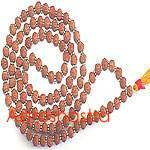 This Rudraksh Siddh Mala is recommended to all the professional , who face lot of competiton and stress in their work profile. This rosary would not only improve your confidence but would also increase your charisma, stamina to face any stress condition. 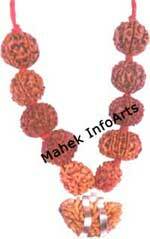 Thirteen Mukhi Rudraksh represents Lord Indra ,the king of Devtas. Wearer is able to enjoy all the earthly pleasures and comforts at his disposal. 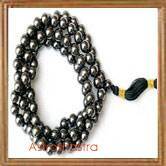 This Rudraksh is also rare and difficult to get but has immense power. Twelve Mukhi Rudraksh symbolises lord Vishnu. Sun god is always kind to the wearer of this Rudraksha, such a person always enjoys wealth, prosperity and worldly pleasures. All twelve ADITYAS are said to be having their abodes in each of twelve faces. The wearer obtains the merits of gifting the cows. Ten Mukhi wearer gets a sense of security. The ten mukhi is very powerful and can help overcome fears and develops a sound mind. The nine mukhi and eight mukhi represents lord ganesha and Maa durga , who would always protect the wearer from all difficulties. 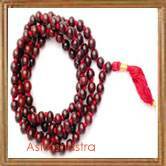 The auspicious siddh mala is made in red thread and with small five mukhi rosary and is blessed with puja and homa done on it to give the possesser the best in his life.